The ol’ eye network took the stage at the Television Critics Association winter press tour this morning, where panels on new CBS series Living Biblically and Instinct gave way to a discussion about politics and social issues on television. This was in place of an executive session with CBS CEO Les Moonves or new president of entertainment Kelly Kahl, which was probably for the best, since such conversations don’t always go the network’s way. So CBS impaneled showrunners and executive producers from its broadcast and streaming shows, including Barbara Hall (Madam Secretary), Shawn Ryan (S.W.A.T. ), Michelle and Robert King (The Good Fight), Jermaine Fowler (Superior Donuts, which he also stars in), and Star Trek: Discovery’s Gretchen J. Berg and Aaron Harberts. 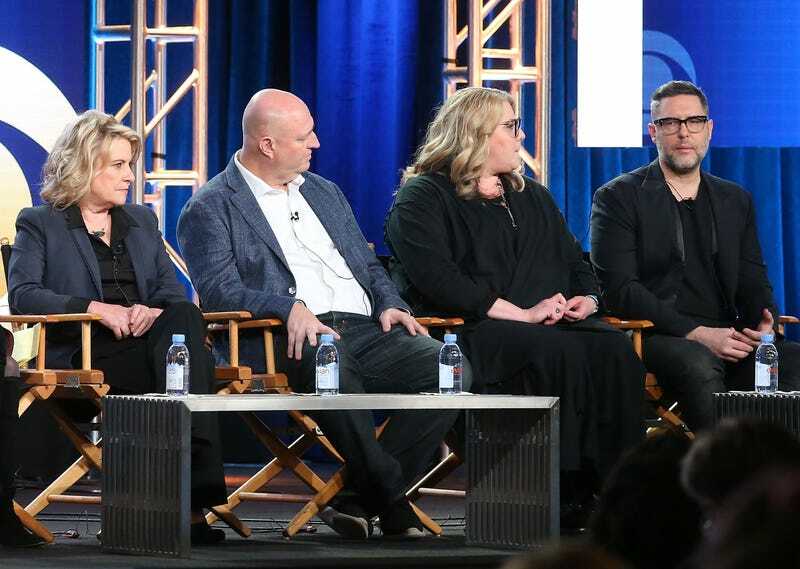 The Discovery EPs talked about keeping the workplace safe for women and promoting greater representation on and off screen, which remained a part of the discussion even when reporters were green-lit to go off topic and ask about what viewers can expect from the second half of the show, which returns January 7. Before it premiered—and back when Bryan Fuller was showrunner—Discovery was breaking new ground by having a black woman in the lead role. Sonequa Martin-Green, who plays Michael Burnham, has proved to the glue of the show, Berg and Harberts agree. Despite some kneejerk backlash, many viewers were delighted to see Martin-Green hold down the U.S.S. Shenzhou with Michelle Yeoh’s Captain Philippa Georgiou, which was another first for the franchise. But [spoiler] Georgiou was killed off early on, which some fans interpreted as a rug pull. Berg and Harberts also shared some light details on season two, which CBS ordered last October. Harberts pushes the more traditional Trek angle as something the duo “wants to explore more” in the new season, which they just started working last month. He acknowledges the “well-documented” embattled season-one production, but enthuses that “This year, we have a fantastic creative team in place, everybody knows each other. But we also have time this year—we have time to do things like more away missions, newer planets. These are stories that might fall a little bit more into a framework of allegory that people love to get from Trek. But we will always continue to have that overarching serialized thread.” And as for the themes or potential storylines, Harberts teased an exploration of faith and “science versus faith.” And again, there will be much more of the TOS canon that will at least be nodded to in the new episodes, which should temporarily please some sticklers. Star Trek: Discovery returns Sunday at 8:30 p.m. ET with “Despite Yourself,” which was directed by Jonathan Frakes.